This friendship can be very successful because these two come up with amazing ideas when together. It’s true Gemini natives can be a little bit too much and distracted up to the point of forgetting stuff or even what they were supposed to do, so the Aries’ patience may be tremendously tried when he or she is best friends with one of them. In spite of being different, these two can get along very well because they can make one another attentive about things each is missing. While both energetic, they have different ways of using their strengths. The Aries is impulsive and wants fast results, the Gemini thinks only of independence and prefers to analyze everything before making a decision. Geminis really know how to tell a story, so it’s impossible to ever get bored when around them. People in this sign really appreciate how the Aries gets things moving and can make any dream come true. However, these two can really see the best in each other, which makes their friendship stronger than others. They’re both very energetic and interested in doing new things, and the Aries can help the Gemini make his or her amazing ideas become a reality. Furthermore, the Gemini can encourage the Aries to become more successful at whatever he or she is trying to do. In conclusion, when these two are good friends, they can accomplish many things together because they’re both oriented towards success and can be very creative. The only thing that could bring them down is the fact that they’re both reckless. For example, the Aries doesn’t care about any danger, while the Gemini is all the time curious about what’s going to happen next, which means they can end up suffering from different accidents. It can be said their partnership is based on both physical and intellectual stimulation because they both enjoy doing any sport and having a good debate. Because they’re similar, these two can communicate very well, regardless what they may be discussing. As a matter of fact, the Gemini is known as a master of communication. Both of them care a lot about their freedom, and the Gemini can be fascinated by how the Aries is always energetic and original. However, the fact that the Twin often changes can truly annoy the Aries, who can as well be overwhelming for the Gemini, with his or her assertiveness. The Ram is always more focused on the materialistic side of life, while the Gemini cares only about knowledge. In spite of this, the Gemini can always understand how the Aries needs to do things fast because the Twin is aware of the fact that he or she is sometimes indecisive and unable to act fast. If the Aries struggles to not become overwhelming, he or she can help the Gemini be more assertive. Because their personalities feature many shades, the friendship between the Aries and the Gemini can be very successful also because these two can come up with amazing ideas when together. The Aries is a cardinal sign belonging to the Fire element and ruled by Mars, which means natives in this sign are very good at taking the initiative and bringing a new type of energy all around themselves. A friendship with them can be thrilling, exhilarating and sometimes challenging. The Aries believes in competition and would never back down from a fight, regardless if this is friendly or more serious. Those who want someone to stimulate them and who’s open to anything new should choose an Aries as their best friend. Only a few other signs have more charisma and while the passion of an Aries can be difficult to handle, it is still amazing for when creativity needs to be expressed. The Gemini is a mutable sign belonging to the Air element and ruled by Mercury, the planet of communication. People born in Gemini love to be around others, to talk, to make jokes and to share stories. They’re curious about anyone and anything, and they surely don’t like to back down when a good opportunity for fun is presented to them. Those who are friends with the Twin can enjoy this person’s spontaneity and playfulness. It doesn’t matter what age he or she may have, the Gemini is always open to new adventures. It’s possible for his or her friends to sometimes feel left out because this native usually has many acquaintances and can’t really hold onto only a few connections. The Aries proves to be a very valuable companion for the Gemini because these two signs are truly compatible. Neither of them cares about how the time passes when they’re having fun because they’re both only interested in living in the moment. As a matter of fact, they’re the only two signs in the zodiac known to do this. If living together, they may have problems with money because both really don’t care about wealth and are only curious about what they can do for fun. The friendship with any of them can be compared with a continuous adventure as they’re both moving very fast and seem to break records when it comes to taking risks. These two natives are all the time interested in getting intellectually stimulated, which means they can have great conversations when together. It’s normal for them to spend hours talking about the universe and different philosophical principles, without forgetting to mention history and some ancestors. Obviously, the friendship between the Gemini and the Aries includes a lot of traveling as well, but don’t expect them to visit different places in the world for the photos because they’re both curious about experiences, things that makes their connection even stronger. While they’re hurried as far as the everyday life goes, their partnership still won’t be rushed as they both prefer to watch it flourish and to make every moment they have together count. This way, their lives become richer and they get to share many things with each other. As said before, these signs are ruled by Mars and Mercury, which are planets of high energy and good communication. The fact that they’re two different personalities and very skilled at talking means the Aries and the Gemini can develop a strong friendship with each other. While the first takes arguments very seriously, the second prefers to only laugh at them and to make jokes. Reacting so differently to harsh remarks and being contradicted means they should avoid fighting as much as possible and keep their heated conversations in control. The Aries is Fire and the Gemini is Air, which means they get along very well because air keeps the fire burning. The Ram will always start new things and think of the next plan, while the Twin will support him or her and keep his or her focus on the action. Therefore, when these two combine energies, great things can start happening. The Gemini can keep up with any pace the Aries imposes and doesn’t mind taking on challenges while also providing all of his or her knowledge. These two signs have different interests, but they very much complement one another. The Aries is more physical and doesn’t mind offering Gemini all kind of intellectual opportunities for this last mentioned one to make different analyses and to come up with incredible solutions for problematic situations. Furthermore, the Gemini can always help the Aries be wiser and less impulsive. 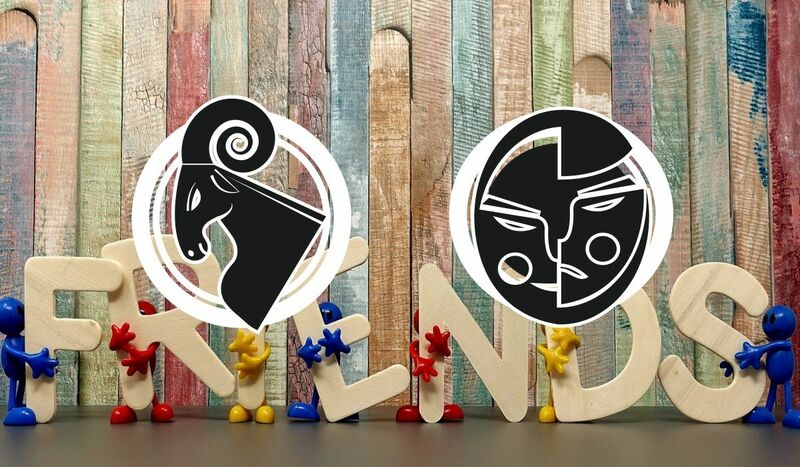 Just like any other friendship in the zodiac, the one between these two is calm unless different problems make their way into their mutual understanding. They both have the same problem of not being able to stick to the same job because they’re known for easily getting bored and wanting to deal with the new all the time. It’s good neither of them holds grudges and that they prefer to move on after an argument. Anyone can trust them with secrets and they’re very intelligent when giving their advice. The Aries is cardinal, the Gemini mutable, which means the first can give the start in any situation, while the second can just go with the flow. This doesn’t mean the Gemini accepts anything or that he or she can be forced to do things. However, the Twin will always be curious about what the Ram has thought of, while the second loves leading and putting him or herself out there for the world to see. The Gemini doesn’t mind working from the shadows and pulling the strings from behind the scenes. They should both be careful not to lose their interest in different activities and passions too fast because neither of them will furthermore encourage the other to stick with any project, so they’d simply start new things without thinking twice about what they’re supposed to do or where the previous activity has left them. What’s great about the friendship between the Aries and the Gemini is the fact that these two natives can be very strong and energetic when together, even if they’re all the time focusing on different things. Because they complement one another, they can form a great alliance that brings them both advantages.